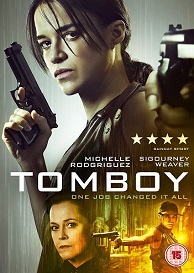 Tomboy is out on DVD on 3rd April and to celebrate we have a great competition for you and 3 copies of the DVD to give away. Frank Kitchen is an assassin at the top of his game. When he's double-crossed by a group of ruthless gangsters he falls into the hands of a rogue surgeon, known only as The Doctor, who transforms him into a woman against his will. Aided by a nurse with her own set of secrets, Frank the hitman becomes Tomboy the hitwoman and revenge is the first thing on her mind... Starring Michelle Rodriguez (Fast & Furious, Machete Kills) and Sigourney Weaver (Alien, Avatar), TOMBOY is a jaw-droppingly audacious revenge thriller you won't forget.